Johannesburg, South Africa, 25th January 2018—South Africa today announced the official number of rhinos illegally killed in the country during 2017 as 1028 animals: a tiny decrease on last year’s 1054. “The marginally lower total in 2017 still remains unacceptably high and with close to three rhinos illegally killed daily in South Africa every single day, the bottom line is the crisis continues unabated,” said Tom Milliken, TRAFFIC’s Rhino Programme Leader.Although this figure marks the third year in a row where the rhino poaching total has dropped since the record high of 1,215 losses reported in 2014, undetected carcasses in vast places like Kruger National Park could easily account for the reported decline. Although official poaching figures are still awaited from other rhino range States, unofficial figures suggest there has been an overall drop in rhino poaching across Africa in 2017. However, combatting rhino poaching effectively will require a concerted global effort, greater information sharing between law enforcement agencies in source and consumer countries and targeted investigations aimed at dismantling criminal networks with tentacles that span the globe. 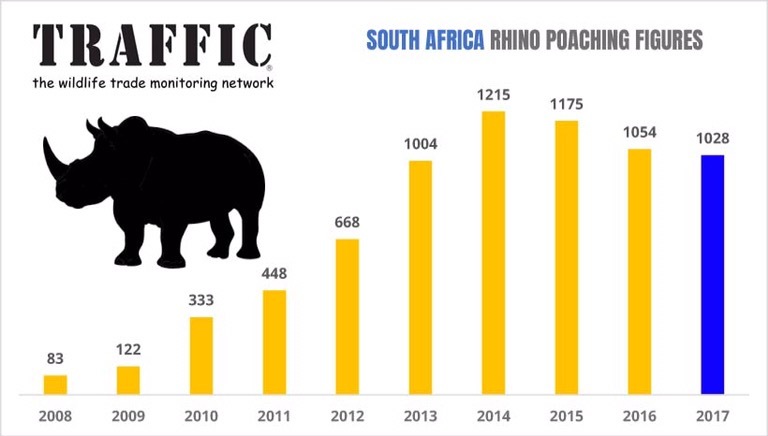 In September 2017, TRAFFIC revealed disturbing new evidence of criminal networks of Chinese origin operating in South Africa processing rhino horn locally into beads, bracelets, bangles and powder to evade detection and provide ready-made products to consumers in Asia, mainly in Viet Nam and China, and called for increased resources to be made available to already over-stretched law enforcement efforts. In the meantime, despite various amendments, South Africa has still to adopt and implement its National Integrated Strategy to Combat Wildlife Trafficking. “TRAFFIC calls on South Africa urgently to adopt and implement its national strategy to combat wildlife trafficking: the potential growth of new markets for rhino products is a deeply worrying development that needs to be nipped in the bud—we’re far from seeing the light at the end of this very long, dark tunnel,” said Milliken.